(Newser) – Impressive: Climbing Everest. Wow: Doing it twice in a matter of days. 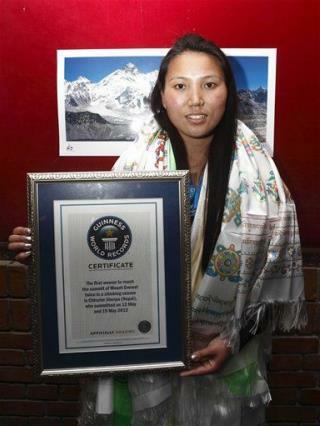 A 29-year-old Nepalese woman entered the Guinness Book of World Records today as the first woman in the world to have made two ascents in one season, having reached the peak of the 29,035-foot mountain on May 12, 2012, and again a week later on May 19. Chhurim (the AP explains that like most Nepalese Sherpas, she uses a single name) rested at base camp between climbs, reports the AFP. Way to go, Chhurim, not only is she courageous enough to tackle Everest but she is sassy enough to have three consonants beside each other in her name! She's hot, too. I wouldn't mind mixing some dna with her.